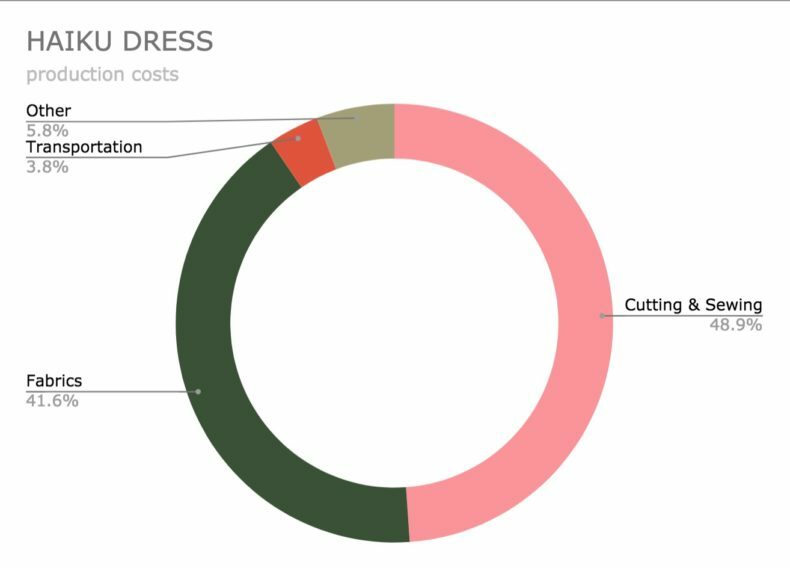 Pricing Finnish Design – What does it cost to produce, sale and distribute a TAUKO dress? What does it cost to design and sell sustainably produced clothes? What are the different actors and what are their shares? Roughly, the TAUKO cost structure consists of four areas: manufacturing, brand, retail, and VAT. Each of them can be broken down into smaller parts, again with their particular cost structure. As an example, let’s look at our Haiku dress. Haiku is, when it comes to the cost division, an average product for TAUKO. It is sold for 225 € including the Finnish VAT, which currently is 24 %. In other words, 45 €. The total production cost of the dress is calculated with 55,40 €. A major contributor to it are materials, salaries and other running costs of the sewing and dyeing companies. Other parts are transportation between material providers, production companies, and final distributors. The costs of the Haiku dress come basically from fabrics, transportation, cutting and sewing. The share of for us, the brad, is 35,29 €, which is 15,7% of the retail price. This money covers design and development costs, personnel, marketing and other running costs such as the rent for our studio in Katajanokka. Additionally, we take the risk of overstocking, i.e. of items that we are not able to sell to retailers and consumers. The retailer margin for a non-online shop in the fashion industry is typically set to be half of the retail price excluding VAT. In the case of the Haiku dress, this is 90,73 €. While this non-online retail structure envisages the shopkeeper to buy in products in advance and thus taking the risk of not selling the products, selling at an online shop-in-shop, such as Weecos, means that this risk is kept by the brand. In case of Weecos, this is reflected in their share per item (20% instead of 50% of the retail price excluding VAT). Weecos, therefore, receives 45 € per sold Haiku dress. The 45,73 € difference then goes to TAUKO to cover costs for the shipping and delivery service, stocking, product returns, and extended customer support. Weecos, therefore, receives 45 € per sold Haiku dress. The 45,73 € difference then goes to TAUKO to cover costs for the shipping and delivery service, stocking, product returns, and extended customer support.